SERVPRO of Bedford Park/Burbank gets calls year round, not just in Spring. It’s Springtime again, and here at SERVPRO we get asked all the time if Spring is our “busy” season. While it’s true, the transition from Winter to Spring gives us many opportunities for helping people with disasters, there really isn’t a “busy” season nor a “slow” season. When the calendar gets close to Spring, melting snow, or rain over frozen ground, threatens water damages in many homes and businesses. But we can get water damage calls just about any month of the year. When extreme cold weather hits the area (like a polar vortex), frozen and burst pipes could be the result. Freezing and thawing weather, or ice storms, can cause ice damming issues, causing water to back up your roof, under shingles and then work its way into your home. Repeated heavy rains can cause localized flooding in susceptible areas and could finds its way into your home. 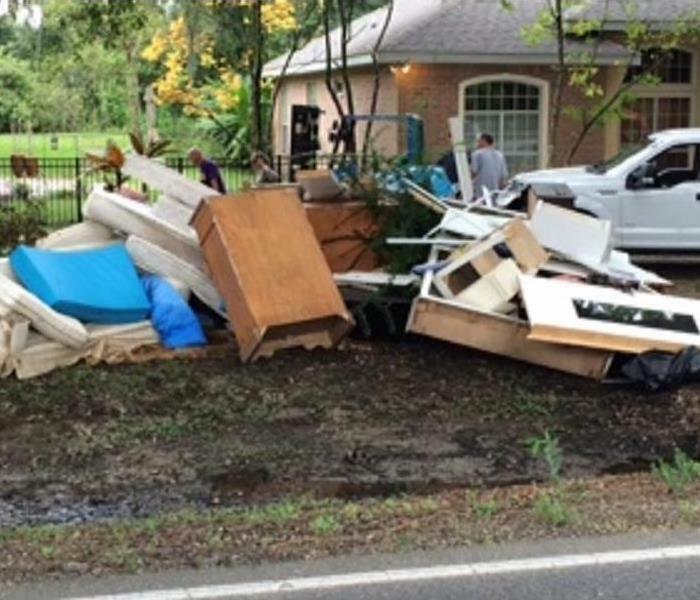 Sudden, extreme downpours with huge rain rates can overwhelm sump pumps and cause minor flooding issues. High winds may cause loose roof shingles to come off, thereby allowing precipitation to find a way inside. On top of all that, there are many ways you can suffer non-storm related water damages, such as: bathtub or sink overflows, pipe leaks, water heater malfunctions, aquarium leaks, condensation issues, etc. If you have suffered any type of water damages, call SERVPRO of Bedford Park/Burbank at 708-430-3600 right away to set up an inspection. Don't let this happen to you. Prepare now. Well, it’s Spring here in the Midwest. That means it can be 70’s one day, then in the 40’s the next, followed by another stretch of 70’s. The old adage: “If you don’t like the weather in Chicago, wait ten minutes!” isn’t too far from the truth. The weather can change in a hurry here. It can be sunny and warm in the morning, cloudy with big storms in the evening, and did they mention a possibility of snow tonight? Most people take precautions when they hear storms are approaching. They bring in their tender plants from the outside, move the patio furniture closer to the house so it won’t blow away, and reattach the downspouts that blew off from the last storm. But, did they take any precautions inside? Heavy rain in a short period of time can overwhelm a sump pump, even when it’s running properly. That water has to go somewhere. 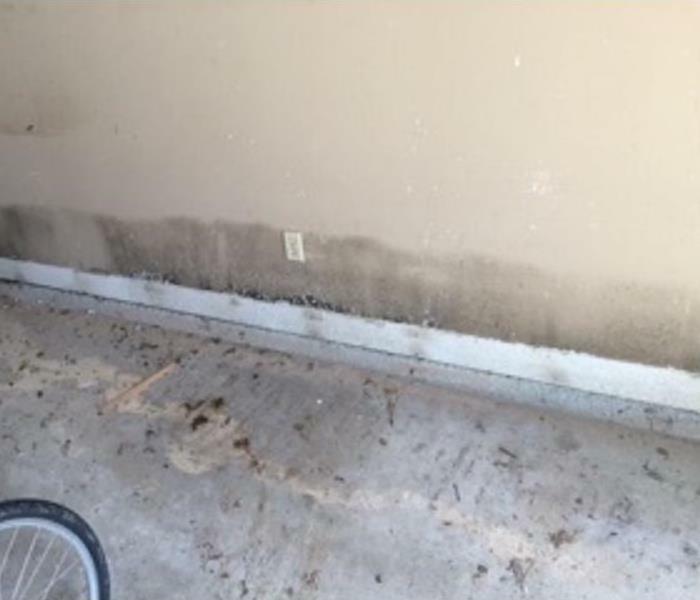 It spreads out across the floor in your basement or lower level, causing water damage to anything susceptible it touches: drywall, carpeting, boxes, shelves, etc can all be damaged by this water. Take time NOW to get ready for that possibility. Remove boxes and store them in a higher place where they won’t get hit with the water. Roll up throw rugs and put them in a safe place, along with any contents on the floor. If you do get hit with water in your lower level, just call the experts at SERVPRO of Bedford Park/Burbank. We can extract the water, dry out the structure, check for hidden moisture in walls, ceilings, or flooring, and spray an antimicrobial to all affected areas. Put this number in your phone NOW! 708-430-3600. We are available 24/7/365, and have equipment ready to do the job! Avoid or limit moving through heavily smoke damaged rooms such as this. You've had a fire. Luckily, no one was injured. But, several rooms in the house suffered smoke and soot damage. Your first reaction is to start going through your belongings, to see how much damage they have incurred during the fire. You start moving boxes around and rummage through drawers and closets. But beware! Going from room to room could drag soot particles into rooms that did not have any initial damage. Repeated walking in soot-filled rooms could also embed the smoke particles into the carpets and flooring, making them harder (if not impossible) to clean. Also, touching the walls, whether on purpose or by accident, could cause the smoke particles to stain the drywall permanently, because of the oils in your fingers. We understand that you are in a hurry to check the status of your belongings. But just haphazardly checking items from room to room can cause more secondary damages than necessary. Calling SERVPRO of Bedford Park/Burbank and scheduling an inspection is the correct option. We can walk through the home with you, assess the damaged areas, recommend options that you can do safely, and set up a cleaning plan. Don't delay! Call us today! 708-430-3600. I've dried the structure; will mold go away? Moldy spots on the wall, but how much is hidden inside the wall cavity? So, you've had a water damage. Your walls got wet, perhaps some carpet as well. A couple days pass, and you notice a small amount of mold on your drywall. The water damage was fixed, and you're pretty sure the walls are now dry. You can still see the mold spots, but do not smell any of that musty smell you normally get when you have active mold. Is the mold now gone? The answer is no. Mold does not simply go away. Once it has eaten into the drywall, wood, cardboard, paper, or anything organic, it will stay there until physically removed. If the musty smell has gone away, it simply means that the mold has gone dormant. Once the moldy areas encounter more moisture, the mold will re-energize. And remember, there can be more mold INSIDE the wall that you can't see! 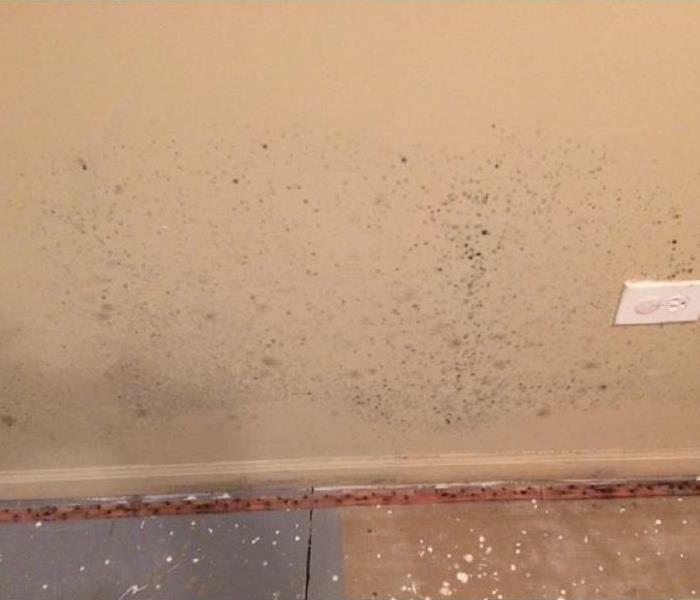 If you know someone who suffered a water loss (pipe break, roof leak, sump pump failure, etc), and you tried to dry it yourself, and now you have a possible mold issue, call the experts at SERVPRO of Bedford Park/Burbank at 708-430-3600. We will come out, assess the situation, give you options to fit your budget, and answer all your questions. To what extent does water damage structure? Water is a powerful thing. It can move cars off the road. It can put out fires. It can also damage of lot of your belongings when it unexpectedly comes into contact with them. Pictured below is the bottom floor of an apartment building. The pipe broke on the third floor, and water not only damaged the third floor, but if flowed down the wall and through the floor into the second floor, and then migrated into the bottom floor. At each level, the water spread out on the floor/ceiling before working its way lower. 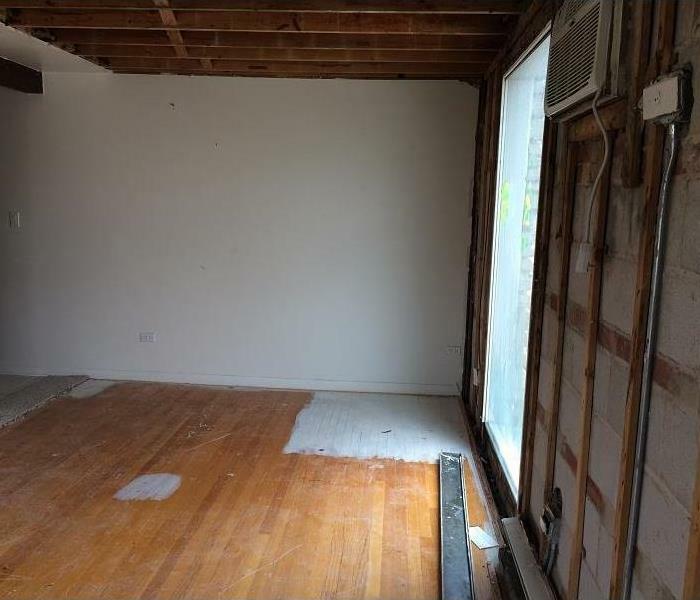 You’ll notice from the picture that a portion of the ceiling had to be removed, the wall on the right had to be removed, as well as the carpet and pad. Wet insulation had to be taken out as well. You’ll also notice that only the affected areas had to be removed; unaffected areas were left as before. When SERVPRO of Bedford Park/Burbank gets called out to handle a water loss, we know how to check for water migration, as well as the proper techniques in drying the materials that can be saved. If you have suffered a water loss, and need that type of expertise, then call today at 708-430-3600. 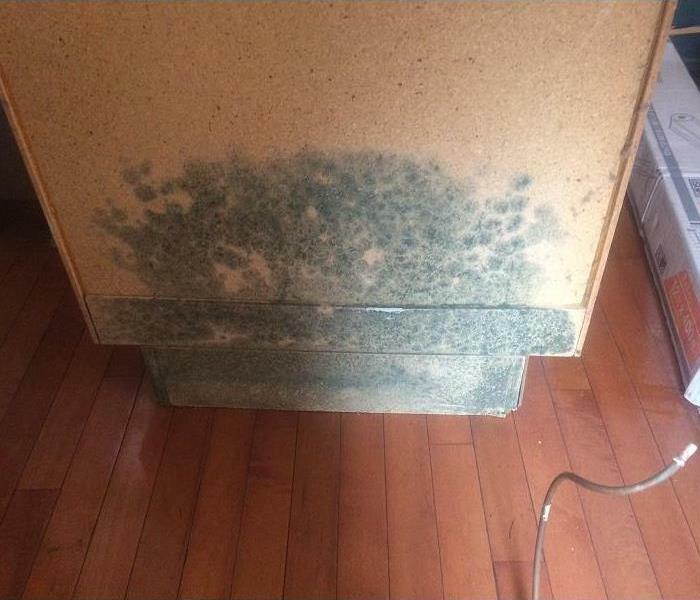 Water damaged cabinet in this commercial property created mold. Call us ASAP to keep this from happening to you! When cold weather invades the area, there’s always a danger to have frozen pipes. Any time the air temperatures plunge to the -25 to -30 range, some frozen pipes are almost inevitable. This winter, with its cold November followed by a warm December, then followed by a brutally cold January, SERVPRO of Bedford Park/Burbank saw its share of commercial frozen pipes. 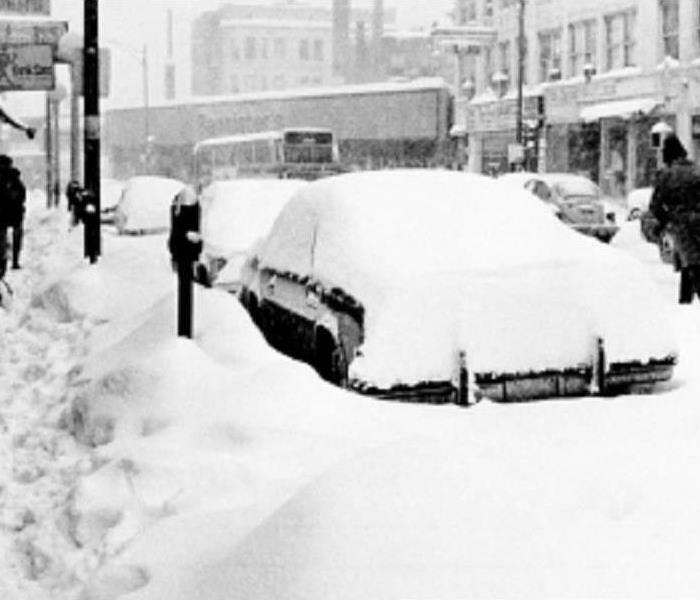 Hotels, banks, condominiums, and even apartment buildings were not spared from the winter’s wrath. And with any commercial job, SERVPRO of Bedford Park/Burbank will make every effort to keep them open and operating as efficiently as possible as we dry and disinfect. We understand that even a dollar of lost revenue that could have been prevented is a dollar too much. We also know that taking shortcuts now can lead to a different kind of disaster later on, like mold. If your home or business suffered from any kind of water loss (broken pipe, leaky faucet, water heater malfunction, etc), call the experts at SERVPRO of Bedford Park/Burbank at 708-430-3600. We’ll come out, assess the damage, and create a plan to keep you up and operating while we systematically extract, dry, and disinfect. Open cabinet doors to allow warm air to circulate around piping. 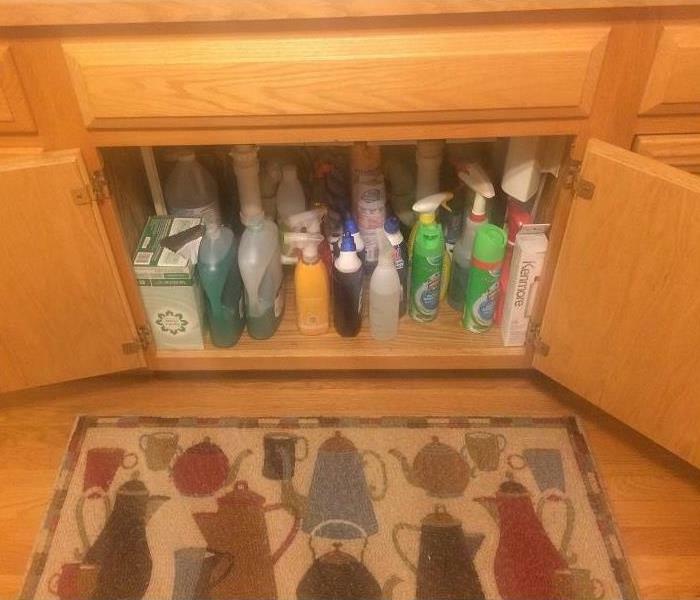 Open cabinet doors around sinks. This allows warm air to circulate around the water pipes. This greatly reduces the chances that those pipes will freeze. Leave a trickle of water running, especially on pipes that are on an outside wall inside your home. Moving water cannot freeze, so as long as the water continues to flow, your pipes will not freeze over. Check insulation around piping. In areas that tend to get very cold, like crawl spaces, wrap water lines with insulation. There are many types of pipe wrap, and can be found at any hardware store. If you are going away for an extended period of time in the winter, do not shut your heat off. Leave the thermostat at a minimum of 55 to provide enough adequate heating to keep indoor pipes from freezing. Place a spigot cover over your outdoor spigot. These are generally made of foam, and provide a layer of insulation from the brutal cold winds of winter. You can find these at any hardware store, and they cost a couple of bucks. If your pipes have frozen, do NOT use a blowtorch or any excessive means to thaw the pipe out. The recommended way to thaw out your pipes is with a hairdryer. The ice in the line has probably expanded the piping. A slow, gentle thawing should not put any more strain on the material. The rapid thawing using a blowtorch may cause the welds to fail, creating yet another problem. If you discover that a pipe has burst, shut the water off and call a plumber, then call the water cleanup experts at SERVPRO Bedford Park/Burbank. We can dry your structure, contents, etc. 708-430-3600. SERVPRO quickly on the scene of a hotel pipe break. 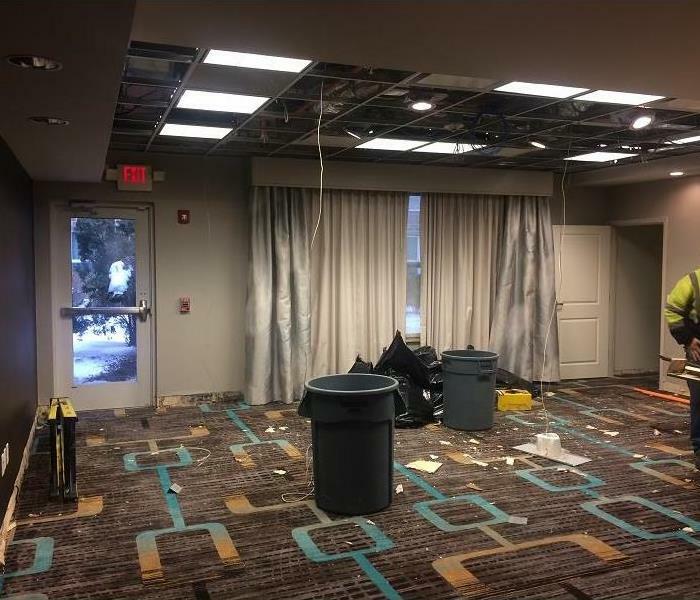 During a recent cold snap, SERVPRO Bedford Park/Burbank received a call from one of the hotels near Midway Airport due to a burst pipe in a ceiling, causing water damages in several rooms. We received the call because this hotel had the foresight to prepare an ERP, or Emergency Ready Profile, this past autumn. SERVPRO Bedford Park/Burbank had a crew on site in about an hour, extracting water, moving wet furniture, etc. We understand that it’s imperative for a business like this to be fully operational as quickly as possible; areas and rooms closed do not make money. Hotel management prioritized the areas that needed to be available first, and we made every effort to accommodate these wishes. Keeping the client in the loop and happy are goals we strive for with each and every job. 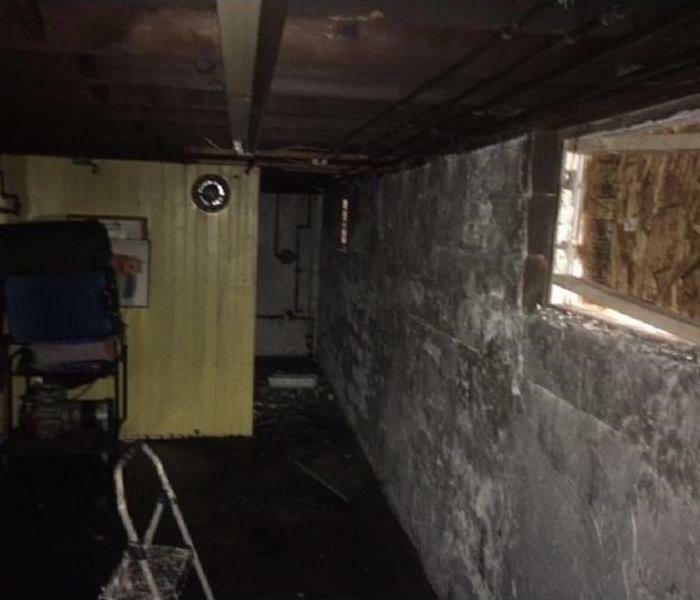 If you suffer some sort of damage: water damage, soot or smoke damage, mold, or anything else that needs to be cleaned up, call the experts at SERVPRO Bedford Park/Burbank, who will put your best interests in mind when planning and executing the restoration process. Call us 24/7/365 at 708-430-3600. SERVPRO Bedford Park/Burbank – your LOCAL source for damage restoration! Though it's tempting to simply paint over mold like this, the better way is to remediate it properly. Everyone looks for the quick, easy solution. So, after you discovered you had a water damage due to a leaky pipe, you fixed the pipe. Unfortunately, mold started to colonize and grow where the leak was. Now you’re wondering if you can simply paint over the mold. If you are seeing mold on drywall, all you’re seeing is the exterior of the wall. What about the interior wall cavity? The framing? Painting over the mold hides the mold, but does not eradicate nor remediate the mold. It can trap moisture behind/under the paint, giving the existing mold more moisture to work with. Bubbled, cracked, or chipped paint. Signs of mold coming through the paint. Active mold can actually eat through the paint. Musty smell has returned, especially on humid days. Remove all moldy materials (affected drywall, for instance) where mold cannot be removed cost effectively. Dry all remaining structure thoroughly. Spray an anti-microbial to help prevent mold growth. Call SERVPRO Bedford Park/Burbank at 708-430-3600. We are the mold experts! Water damage caused this drop ceiling to collapse. A faulty pipe lead to an extensive water damage to a commercial property's ceiling. Several ceiling tiles were too wet to stay up, and fell to the floor. This area was unusable until the water leak was fixed and the area disinfected and cleaned up. 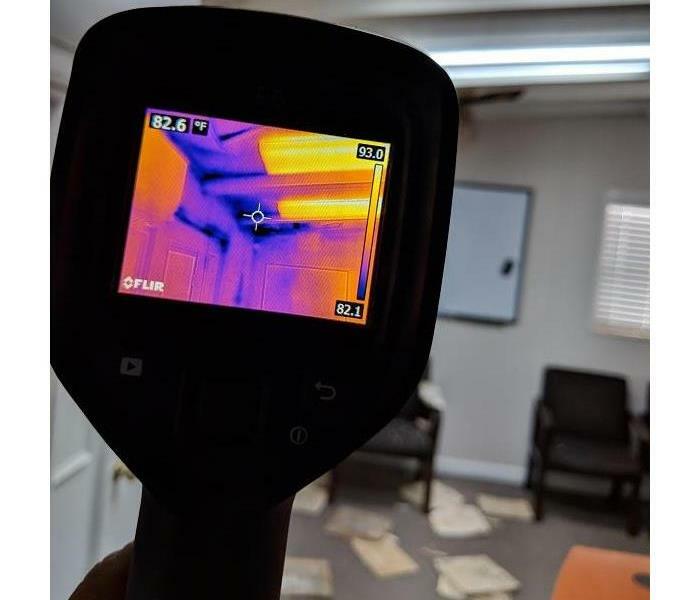 SERVPRO Bedford Park/Burbank was called in, and with the use of our specialized tools, we determined exactly where the water migrated and which walls, floors, and ceilings were affected. Meeting with the building manager, a plan was put in place where SERVPRO could work AND that portion of the building could remain open and productive. SERVPRO Bedford Park/Burbank knows how important it is to keep commercial properties running at 100%, so we will work with the manager to be able to perform our tasks while staying clear of the day-today operations as much as possible. If an area does have to be closed, we make every consideration to do our work causing the least interruption possible (after hours, weekends, etc). We're here to help, not get in the way. If your business suffered any type of disaster (fire, smoke, water, mold, etc), call the experts at SERVPRO Bedford Park/Burbank at 708-430-3600. We have your best interest in mind! 4/10/2019 - Spring storms = SERVPRO's busy season? 3/27/2019 - I've dried the structure; will mold go away? 3/18/2019 - To what extent does water damage structure? 1/16/2019 - Can I paint over mold?